WEEDS have invariably been considered unwanted by modern agriculturists who have always laid emphasis on their removal. They affect crops by competing for nutrients. 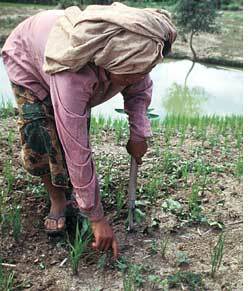 India loses an estimated 30 per cent of its crop yield every year due to weeds. This is more than the damage wreaked by pathogens like fungi, bacteria and viruses (16 per cent) or by insects (12 per cent). Yet farmers who spend money on herbicides would be surprised to know that weeding adversely impacts the entire food web. Researchers in Finland found weeds important for sustaining birds and bees--key crop pollinators. Their seeds are important for farmland birds and their flowers support pollinators. The group studied the relative importance of weeds to the ecosystem and based on the number of interactions between the animal groups and the weeds, they came up with biodiversity indices. For the study, they selected 25 weed species found abundantly in cereal fields of southern and central Finland and recorded the number of different interactions the animal groups have with weeds. Each weed species was evaluated based on the number of interactions. It was found that the relative importance of the weeds was dependent on the animal groups. For example, annual weed species able to produce numerous seeds were essential for the farmland birds, just as some perennial weed species were important for pollinators. The highest number of interactions were seen between weeds and leaf eating insects. Due to these multiple interactions, weeds support high species diversity in agroecosystems. In a particular ecosystem, any decline in the weed species affects the interaction between the animal groups and the weeds, which in turn affects biodiversity. Despite this understanding, linkages between various players in a food web have never been used as indicators. "Given the importance of such interactions, indices based on them could help in detecting and preventing the eventual collapse of food webs that are a consequence of changing agro-biodiversity," said Terho Hyvnen, of mtt Agrifood Research in Finland. He is the lead author of the paper published in the November 2008 issue of Biological Conservation. The study focused on weed surveys done in two time periods--between the 1960s and the 1980s, and then between the 1980s and the 1990s. The first period saw the rise of high-input intensive agriculture and high herbicide use. The proportion of the herbicide-treated area increased from 25 per cent in the 1960s to 79 per cent in the 1980s. This could explain why the 25 weed species used in the study represented 93 per cent of the total weeds in the 1960s but declined to 89 per cent towards the 1980s. The number of interactions or the values of biodiversity indices showed a marked decline accordingly. The value for interactions between farmland birds and weeds went down by 82 per cent, which was more pronounced than that for wild bees (77 per cent) and leaf eating insects (76 per cent). The study attributed this to a drastic decline in weed species which were important for their diet. The period between the 1980s and the 1990s witnessed a shift towards organic farming and a reduction in herbicide use. Organic farming has been linked to increase in biodiversity and the area under organic farming has been used as an indicator of agroecosystem biodiversity. However, despite shifting to organic farming, the values of the indices improved only slightly and did not recover to the 1960s level. "The area under organic farming alone cannot restore the ecosystem services provided by weeds. Rather, application of less intensive measures (in terms of herbicide application) in crop management is needed," said Hyvnen. It is important to maintain a balance between biodiversity and crop yield. For this, weed management is crucial. The study suggested removing weeds based on their relative importance in the food chain. Other studies have shown that farmers, such as those practising shifting agriculture in the northeastern states of India, remove weeds manually and leave about 20 per cent untouched. This is a threshold to maintain balance between crop yield and agro-biodiversity, studies have shown. "Weeds are important for maintaining crop yield as they protect crops from pest attack and also maintain soil fertility," said P Sudhakarsamy, a scientist at Madurai Kamaraj University who has studied shifting cultivation. Measures like crop rotation to manage weeds and selective removal of weeds should be adopted rather than applying broad-spectrum herbicides, added Sudhakarsamy.